Half Moon Bay is the "new Carmel," with art galleries, specialty stores, farms, nurseries, shopping centers, arts and crafts, antiques, clothing, surfing, fishing, produce, sporting goods, bookstores, jewelery, candy and specialty foods, etc. See the Local Services section if you don't see the category you're looking for here or use the Search in the left column. You don't want to miss Half Moon Bay's charming and historic Main Street, which many visitors unknowingly pass by as they travel through on Highway 1. 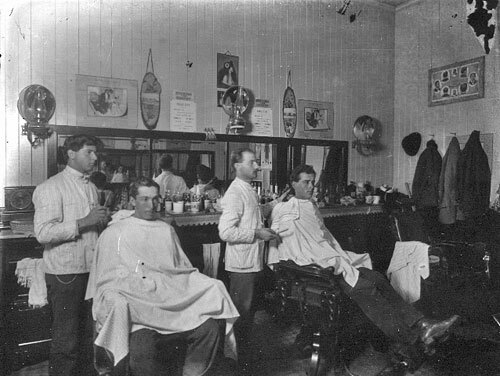 Half Moon Bay barber shop in the early 1900's, possibly in the Enterprise Saloon on Kelly Street just west of Main Street. The prices on the wall show: shave 15 cents, haircut 25 cents, sea foam 25 cents, shampoo 25 cents, hot towel 5 cents, hair tonic 25 cents. Note the oil lamps on the wall. Printed from original 8x10 glass negative. ©1995-2010 Coastside Live, 418 Main St, Half Moon Bay, CA 94019. Powered by Rogue Web Works, LLC. All rights reserved.